http://shellysimagesblog.blogspot.com/ (Anything Goes ) Good morning friends, it is so good to be back here posting. My card today is for these challenges. He is such a cute snowman. Hope this is the only winter we see this year. brrrrr. this is fabulous. love that background. glad to see ur home safe & sound. How sweet and adorable is he! Love the snowflake background as well. We don't have snow here in Adelaide, so it holds a bit of fascination for me, love the look of it. 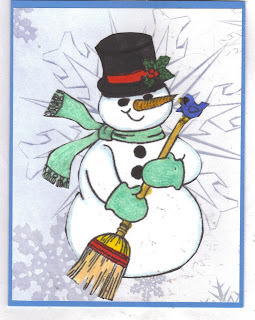 Your snowman is fantastic, great colouring too, and it is nice to see you back and posting. My snailmail is sandra_how@optusnet.com.au I've included here as when I leave comments I always get an email saying they are undeliverable to your e-mail box. Another beauty of a card Judy. Snowmen are my favorite. Fantastic snowman! Thank you so much for sharing your fabulous coloring with us at 4 Crafty Chicks.